The Sustainability Networking brings together CREW Boston members from all areas in commercial real estate interested in interdisciplinary conversations about green buildings, climate change, resilience, and public action. On April 5th, the CREW Boston Sustainability Group hosted a presentation led by CREWBoston member Ellen Watts, and her Architerra colleague, Anna Arscott, to introduce rexBoston, Driving Resiliency, Leveraging Investment & Showcasing Innovation. rexBoston – resiliency exemplified – is a bold vision to catalyze 130 innovative current and potential projects throughout the City, accelerating climate adaptation and carbon neutrality and showcasing replicable solutions in an international resiliency exposition opening in 2020 and culminating in 2030. Inspired by CREW Boston members’ visits to Hamburg and Copenhagen, rexBoston embraces climate action as an opportunity for growth in support of the City’s Imagine Boston 2030, Climate Ready Boston, Go Boston, and Resilient Boston goals. Members heard from Pam Messenger with Friends of Post Office Square about the alliance formed in 2016 between Friends of Post Office Square, MIT and Boston Medical Center (BMC) to buy electricity from a large new solar power installation, adding carbon-free energy to the grid and demonstrating a partnership model for other organizations in climate-change mitigation efforts. 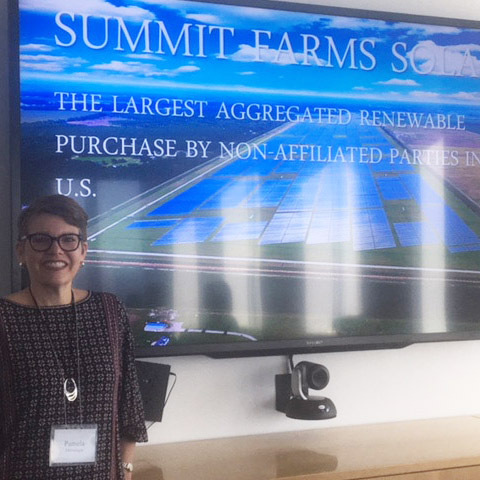 Their 25-year Power Purchase Agreement enabled the construction of Summit Farms, a roughly 650-acre, 60-megawatt solar farm in North Carolina, the largest renewable-energy project ever built in the U.S. through an alliance of diverse buyers. Summit Farms has been operating for a year. Architerra principal and co-founder Ellen Watts and architect Caitlin Gilman presented Architerra’s winning vision for the Boston Living with Water Competition to the CREW Boston Sustainability Networking Group. The competition sought resilient design solutions to address the challenges of climate change and rising sea level in Boston.